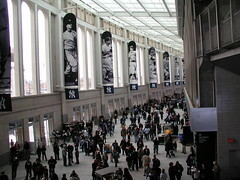 View of the grand entrance hall on 161st Street, taken from the second level. 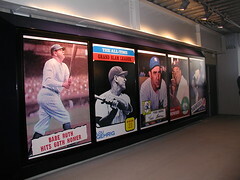 Just outside the Yankees Museum inside the new Yankee Stadium, reproductions of classic baseball cards, done life-size, adorn the wall. 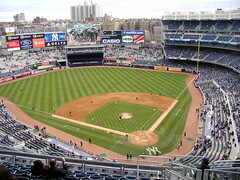 The view from my season tickets, section 421. 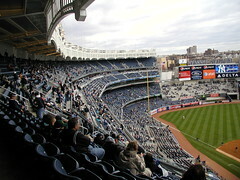 Another view from Section 421. Here’s a photo I bet you won’t find in the New York Times. 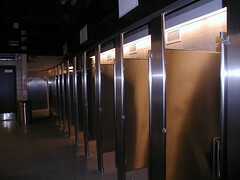 The new look for the women’s restrooms! Gone is all the horrible Pepto Bismol pink! And the bathrooms were heated! Surely that’ll be important this year when the World Series stretches into November!! Coming up in this week’s Welcome Back Baseball! An interview with writer Dale Tafoya, more book reviews, a roster preview… who knows, maybe I’ll even make some predictions…!! This was written by Cecilia Tan. Posted on Monday, April 6, 2009, at 12:03 am. 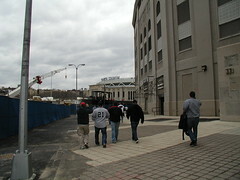 Filed under Great Ballparks, Yankee Fan Memories. Bookmark the permalink. Follow comments here with the RSS feed. Post a comment or leave a trackback.